Soundtrack music. It sounds generic to some. But think of the challenge of having to compose music that somehow fits the images in a film. Even influencing the perception of those images. Some of the best bands have tackled the job. Tangerine Dream, Pink Floyd, and Goblin to name a few. 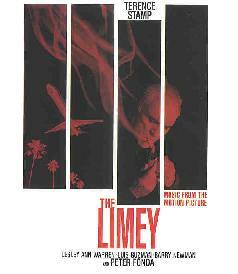 I'm afraid I haven't seen The Limey yet but there's some interesting music here that certainly conjures up images of what I know the film to be about. After opening with tracks from The Who, The Hollies, The Byrds, and Boston, the instrumental music from the film takes over. Danny Saber composed several tracks and Cliff Martinez composed the rest. The Saber tracks utilize hip-hop beats but with a rockin' guitar and some pretty spaced out synths on the first track, "Moog Symphony". Saber seems at all times conscious of his rhythms and the repetitive hip-hop beats are an interesting backdrop for the more rockin' and sometimes bluesy music that accompanies it. "Limey Vibes" is my favorite of the Saber tracks with its cool organ melody played over the hip-hop rhythms. The Martinez tracks utilize more standard orchestral instrumentation, but are filled with a feeling of intensity and suspense. Simple layered piano lines and strings create a quietly energised atmosphere that kept me looking over my shoulder. But hey, that's the soundtrack composer's job right? It was fun paying closer attention to a film soundtrack than I typically would and there's a few pieces here that would appeal to AI readers. I missed the film when it was in theaters but I'll grab it when it hits the video racks. The CD should be readily availble in stores.